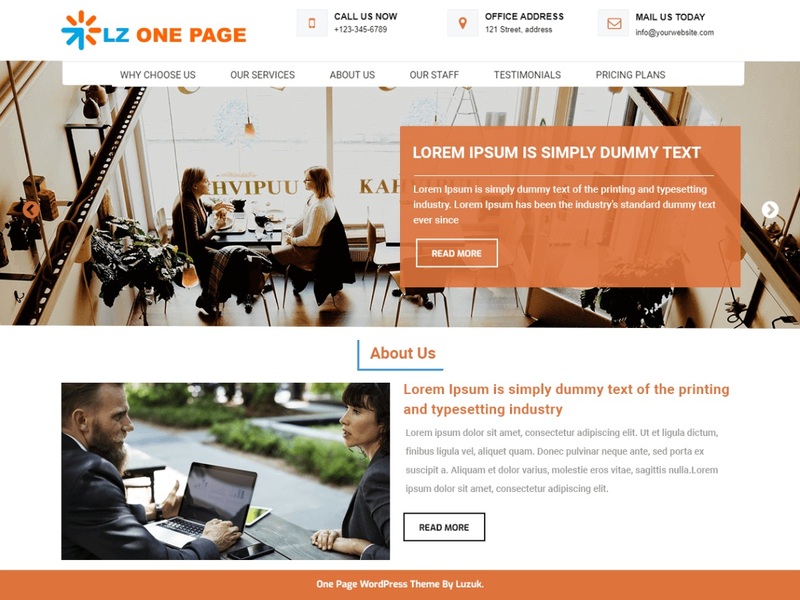 LZ One Page is a stunning, dynamic, performance focused and flexible one page WordPress theme for landing pages, personal websites, blogs, small businesses, and online shops. It can take the skin of any type of website whether it is for a local shop or a corporate company, a travel agency or a real estate agency. It is extremely lightweight and hence loads really fast. It is a responsive theme that looks gorgeous on any mobile, tablet or desktop. This one page WordPress theme is multi-browser compatible, social media integration and multilingual; it supports RTL writing so you can build it for different demographics. It has a clean and bug-free design to comply with the WordPress standards of coding. You get many options to style the website according to your needs like you can choose between boxed, full-width and full-screen layout; place navigation menu at the center, left or right of a header and add different widgets in the footer area. It is optimized for search engines so your website will get higher rank in Google search. This one page WordPress theme has smart ways to include a call to action (CTA) buttons. Various custom post types are included in it like a gallery, testimonial section, subscription form, latest news, and others, each of which can be used as per your needs.